In collaboration with the Rijksmuseum, Amsterdam, Dulwich Picture Gallery hosts the first-ever exhibition devoted to the painter and draughtsman Adriaen van de Velde (1636 – 1672), one of the finest landscape artists of the Dutch Golden Age. Over a career of less than two decades Van de Velde produced a varied body of paintings and drawings that earned him tremendous posthumous fame in the eighteenth and nineteenth centuries, when he was one of the most sought-after names among collectors in Germany, France and England. Van de Velde was born in Amsterdam, the son and brother respectively of the marine painters Willem van de Velde the Elder and Willem van de Velde the Younger. 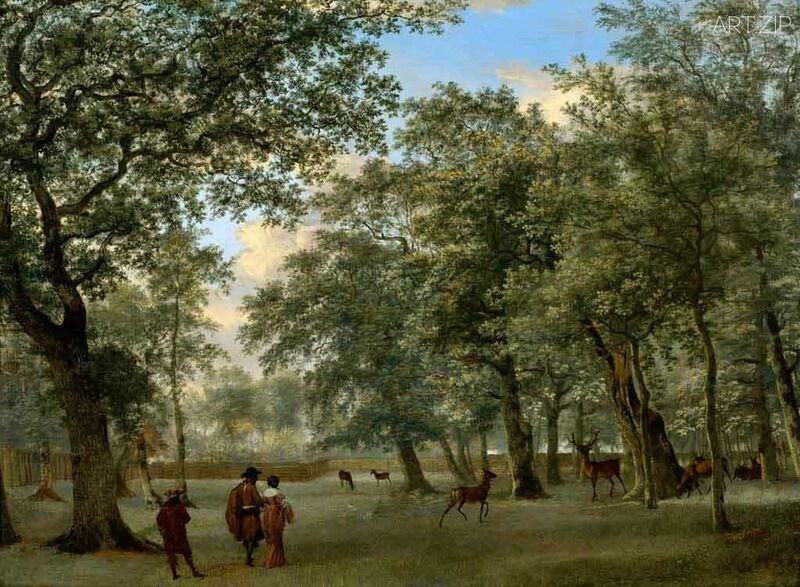 Adriaen van de Velde, however, pursued an independent career as a landscape painter to focus on tranquil landscapes that depict both typically Dutch and Italianising views populated by figures in peaceful harmony with animals and the surrounding landscape. 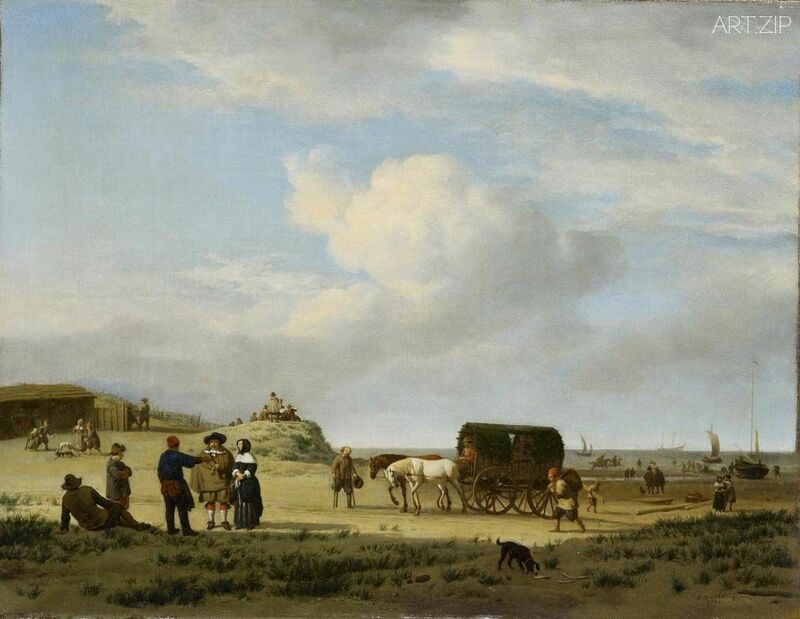 Adriaen van de Velde, The beach at Scheveningen, 1658, Oil on canvas, 52.6 x 73.8 cm, © Museumslandschaft Hessen Kassel, Gemäldegalerie Alte Meister. Adriaen van de Velde: Dutch Master of Landscape (12 October 2016 – 15 January 2017) brings together 60 of his most accomplished works, including landscapes and beachscapes as well as an extraordinary selection of exquisite preparatory studies, many of them in red chalk. Displayed alongside the artist’s paintings, these studies offer a rare glimpse of a seventeenth-century landscape painter at work, from conception to completion. The show also includes pen-and-ink drawings and watercolours that stand alone as works of art in their own right, revealing the extent of the young artist’s talent. 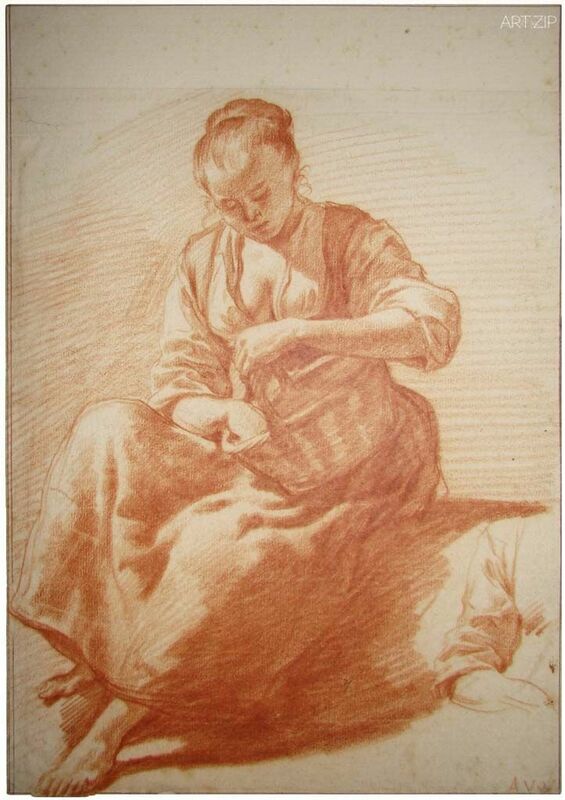 This exhibition provides an opportunity for the public to get to know the work of one of those exceptionally gifted and refined artists of the Dutch Golden Age who has more recently slipped through the net of history but who deserves to be rediscovered as the great painter and draughtsman that he is. What’s more, his drawings provide a fascinating opportunity to see a seventeenth-century Dutch artist at work: we can, as it were, look over his shoulder to see how he composed his landscapes. The exhibition opens with Van de Velde’s most accomplished paintings, made when the artist was still in his early twenties. Blissful scenes such as the masterly Beach at Scheveningen, 1658 (Gemäldegalerie Alte Meister, Kassel)introduce Van de Velde’s highly individual style, in which everything stands out in the pure light of a summer’s day. Especially in his later work Van de Velde succeeded in incorporating the sun-drenched atmosphere of Italianate painters such as Karel Dujardin in his works, but brought a refinement to his subjects that was rarely matched by his contemporaries. Van de Velde probably never travelled outside Holland; the mountainous scenery and Italianate character of some of his landscapes and drawn studies sprung from the imagination and were inspired by the work of fellow artists. Examples include the Pastoral scene from the Museo Thyssen-Bornemisza, Madrid, and the preparatory composition drawing for this painting from the Morgan Library & Museum, New York. There are few artists whose working procedures can be illustrated as well as in the case of Van de Velde, making it possible to follow precisely the various phases of his creative process. 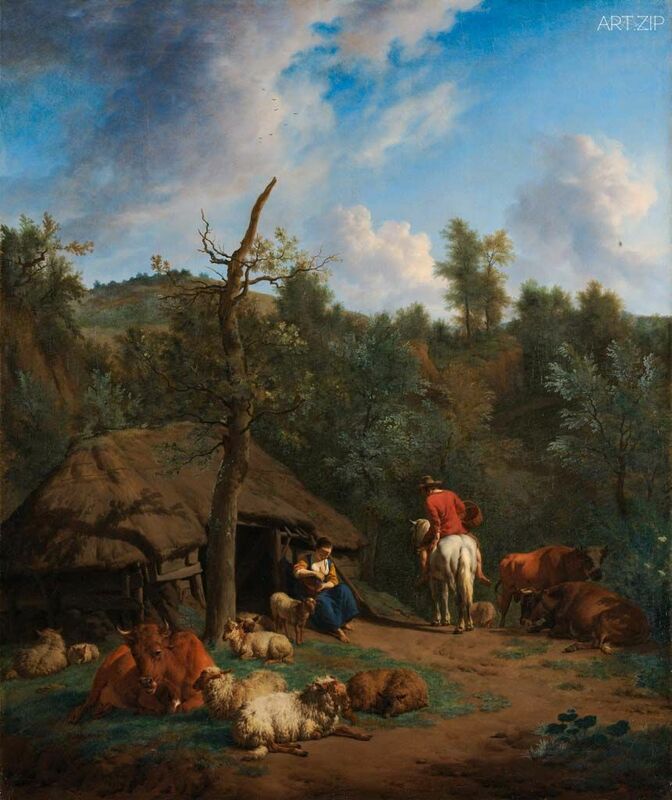 For the first time Van de Velde’s famous painting of The Hut (Rijksmuseum) will be displayed alongside the drawn studies that the artist made in preparation for the painting, providing insight into the work’s genesis.Such studies include Seated woman with basket and Resting cow with three sheep (both Amsterdam Museum), as well as a drawing from a private collection depicting the hut that lends the picture its name. These and other studies in the exhibition reveal Van de Velde’s almost obsessive attention to detail and how he proceeded from a rough composition sketch in pen and ink to separate studies of animals and figures from life, often executed in the medium of red chalk. 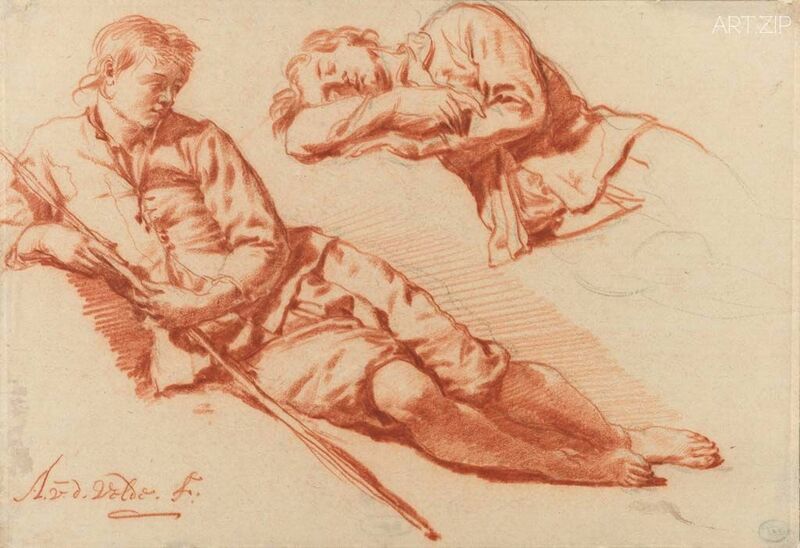 Few seventeenth-century Dutch landscapists devoted so much time and energy to sketching from models in the studio and the exhibition will showcase some of the artist’s remarkable figure studies, including a sheet with Two Studies of a Reclining Shepherd (Rijksmuseum), which in its elegance and exquisite use of red chalk prefigures the work of eighteenth-century French artists such as Antoine Watteau and François Boucher. 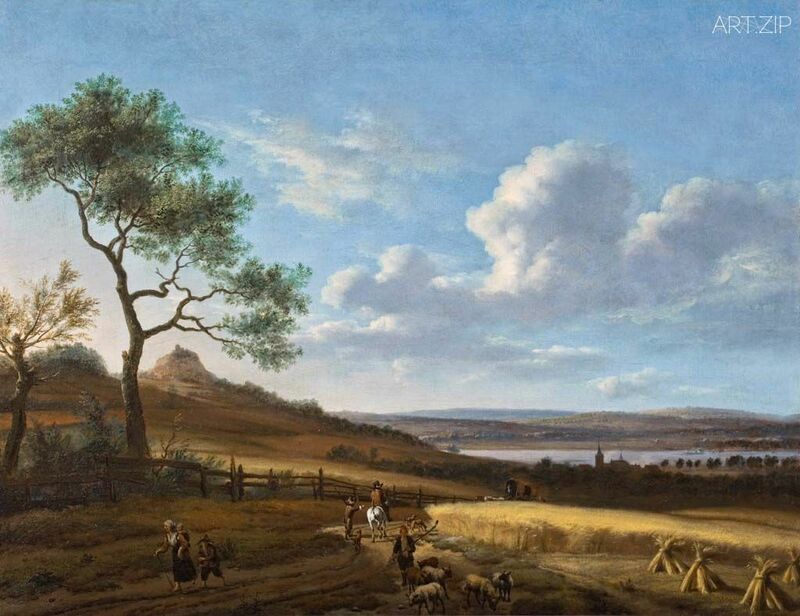 Van de Velde excelled in the depiction of the human figure and their integration into a landscape and was frequently asked to paint the staffage in the landscapes of his contemporaries; his figures can be found in works by artists such as Jacob van Ruisdael and Meindert Hobbema, and, for example, in Dulwich Picture Gallery’s Two Churches and a Town Wall (1660s) by Jan van der Heyden, which will feature in the exhibition. The exhibition includes a selection of the artist’s cabinet-sized works and concludes with his larger paintings. Together they illustrate the enormous variety of subject-matter in Van de Velde’s oeuvre, from panoramic views to hunting scenes, pastoral subjects or depictions of winter. 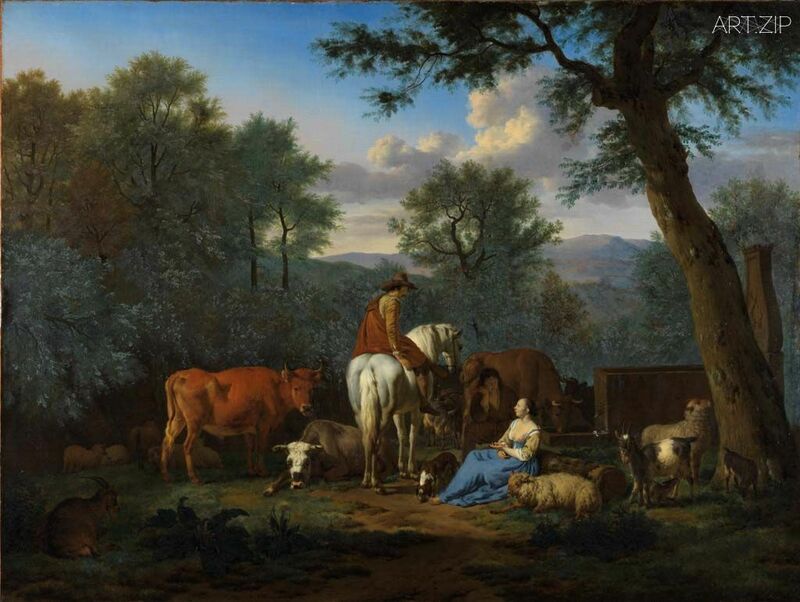 The larger works include the monumental Portrait of a Family in a Landscape (Rijksmuseum) and the idyllic Landscape with cattle and figures (Fitzwilliam Museum, Cambridge). Together these works show a Dutch Arcadia as it was imagined by this exceptionally refined artist. 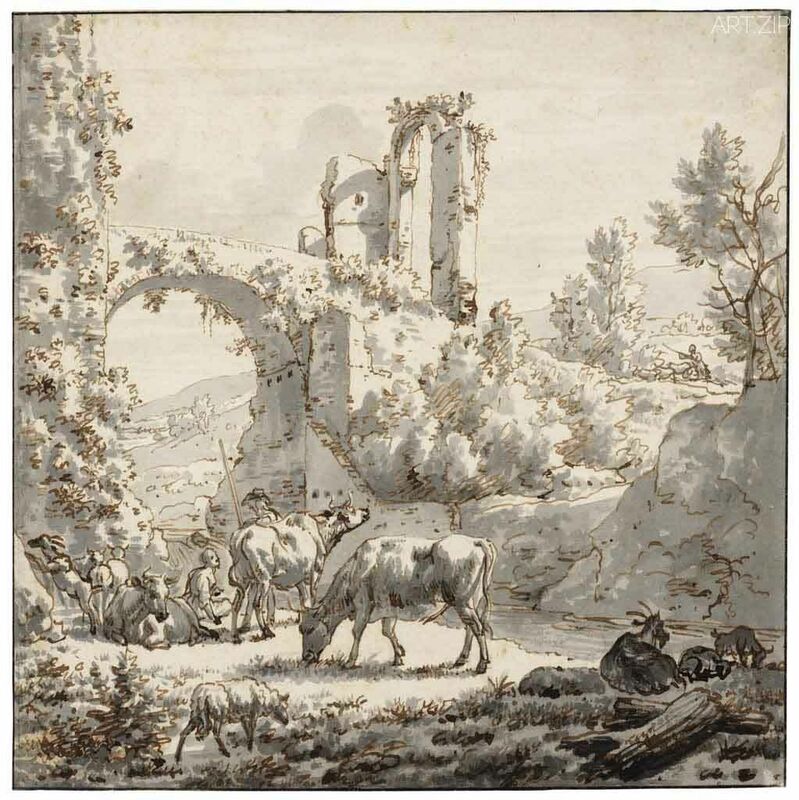 Adriaen van de Velde: Dutch Master of Landscape is curated by Bart Cornelis, former Deputy Editor of The Burlington Magazine, London, in collaboration with Marijn Schapelhouman, Senior Curator of Drawings at the Rijksmuseum. The exhibition includes works from over 20 lending institutions and private collections, including the Royal Collection, Ashmolean Museum, Oxford, Fitzwilliam Museum, Cambridge, Gemäldegalerie Alte Meister, Dresden, The Morgan Library & Museum, New York, Musée du Louvre, Paris, and The National Gallery, London. The exhibition is part of Dulwich Picture Gallery’s Rediscovering Old Masters: The Melosi Series. This exhibition is supported by a grant from the American Friends of Dulwich Picture Gallery Inc., made possible through the generosity of The Arthur and Holly Magill Foundation. Adriaen van de Velde: Dutch Master of Landscape has been organised by Dulwich Picture Gallery, London, and the Rijksmuseum, Amsterdam.